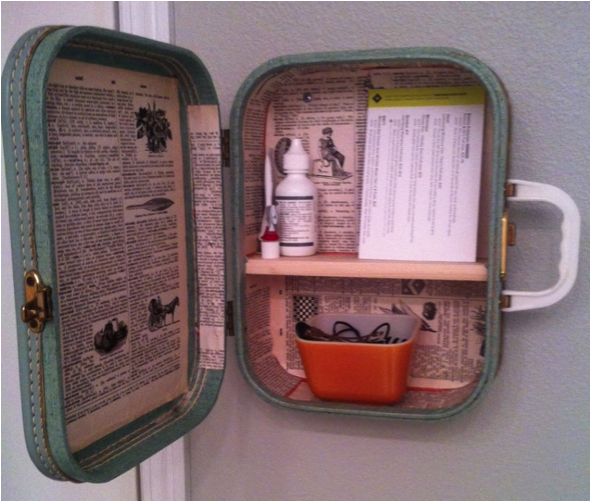 I have been looking for a way to add more storage in my bathroom, but in a unique way. Bathroom shelving options are often boring and I definitely didn’t want that. I also didn’t want open shelves that need frequent dusting. My solution was found at arc! 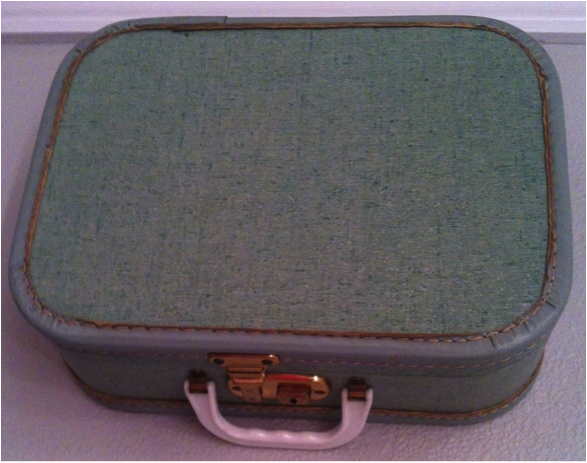 I was trolling the aisles a couple months ago and found this adorable vintage suitcase. It’s so small and it’s made of sturdy cardboard (versus fabric or vinyl) so I assumed it was a child’s play suitcase. But I loved the light blue/aqua color and saw a lot of potential. It was also only $5.99, which added to its appeal. 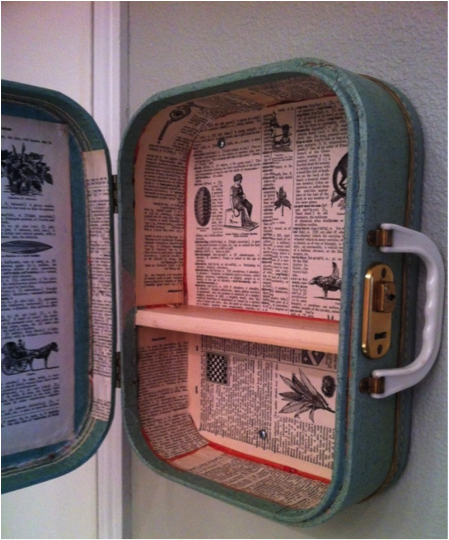 I’d seen bathroom shelves made from vintage suitcases on etsy before and figured I’d try my hand. I knew it would be easy enough to mount it to the wall, but I also wanted to add an additional shelf. That way I could store more inside. The first thing I had to do, though, was figure out how to cover up the peeling interior. After a lifetime of being played with, the inside was looking rough. 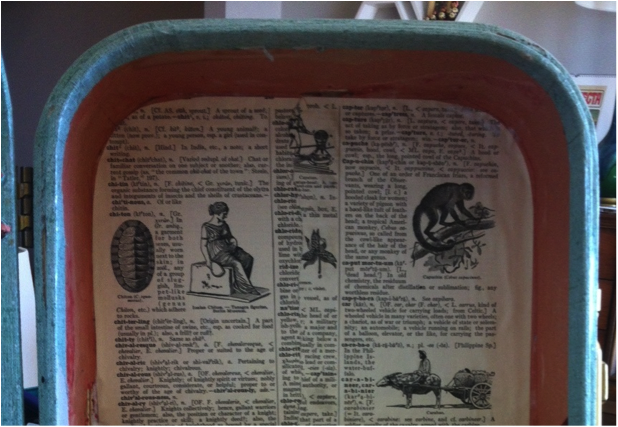 I decided to use some pages from a vintage dictionary I bought a while ago (also from arc) and mod podged the insides. I think it turned out great! After that, I used a scrap of wood and sawed it down to the correct length. It was a tight fit but I was able to wedge it inside the suitcase horizontally, and then hammered a few nails through the sides of the case and into the shelf for insurance. I thought about painting or staining the wood, but I liked the look of it as it was. The final step was hanging it up on the wall. I had some good, strong anchors from a past project and used these to make sure that no matter how much I ended up storing inside, the suitcase would stay up on the wall. I love how it turned out! It’s been great having extra storage and I definitely like how it looks up on the wall.